Professor to teach business ethics in South Korea as an "International Scholar"
Rev. Oliver F. Williams, C.S.C., a noted expert in business ethics and an associate professor of management at the University of Notre Dame, will spend the 2012-13 academic year introducing South Korean students to the concepts of ethical leadership and international efforts to use commerce as an instrument of peace. Father Williams has been designated as an International Scholar and visiting professor at Kyung Hee University in Seoul, South Korea. He will be teaching a course for both graduates and undergraduates on business ethics, as well as on the topic of “The United Nations Global Compact: Peace Through Commerce.” Williams has taught in Seoul in 2010 and this July, and was selected as an International Scholar for the year on the basis of his teaching and research. The UN Global Compact is the world’s largest voluntary corporate citizenship initiative with more than 6,000 businesses around the world as members. “Peace through commerce” refers to a philosophy that states corporations have responsibilities to the societies they operate in, particularly in developing countries. Commerce is considered in terms of its potential to build connections between disparate parties — crossing cultural, religious and personal boundaries — in order to reduce conflict and promote social well-being. Father Williams, the editor or author of 15 books as well as numerous articles on business ethics in journals, plans to write a book for the Routledge Global Institute on the development of corporate social responsibility, its history and its promise. He also will present workshops on “Business as a Vocation” for the Catholic Church in Seoul. A member of the Mendoza College faculty since 1983, Father Williams specializes in the areas of business ethics, corporate governance and Catholic social teaching. 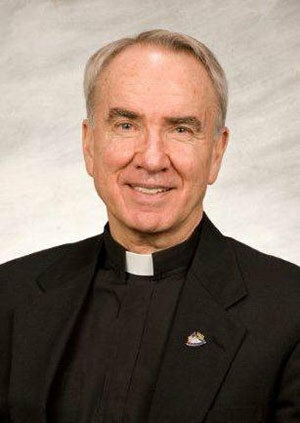 A former naval officer, Father Williams earned his doctorate from Vanderbilt University and his bachelor’s and master’s degrees from Notre Dame. He served as associate provost of Notre Dame from 1987-94 and is a past chair of the Social Issues Division of the Academy of Management. In 2006, Williams was appointed a member of the three-person Board of Directors at the United Nations Global Compact Foundation. He recently served as a chair for a session on “Building a New Ecosystem for a Sustainable Economy,” among other responsibilities, at the United Nations Third Annual Global Forum for Responsible Management Education, held this June in Rio de Janeiro. Originally published by Carol Elliott at newsinfo.nd.edu on August 20, 2012.